Tom Esau Brada is a video journalist at the Press Association in the UK, who went to the Greek island of Lesbos in a personal capacity after feeling “desensitized” from all of the news stories about refugees. “We report on the migrant crisis so often to the point that I personally felt desensitized to the reality of each person’s complex narrative and vulnerability, Brada told The Pappas Post. He went to volunteer with an NGO on the island, helping with site maintenance at the Kara Tepe camp, cleaning the Moria camp most mornings and helping with beach landings at night. Journalists are not allowed to film inside Moria, a place that’s been called “Hell on earth” for the 6,000 or so people living in a space that was designed for 2,000. “I was obviously not allowed to be filming in the camp so I had to be discrete and was filming predominantly on my phone. I had built up a rapport with many people in Moria from chatting with them each morning and when they realized I was filming they were happy I was trying to raise awareness of their current limbo,” Brada said in an interview via Facebook messenger. Brada also interacted with the hundreds of people camping outside the camp, in olive groves and around the island, who have opted not to take up residence inside the camp. 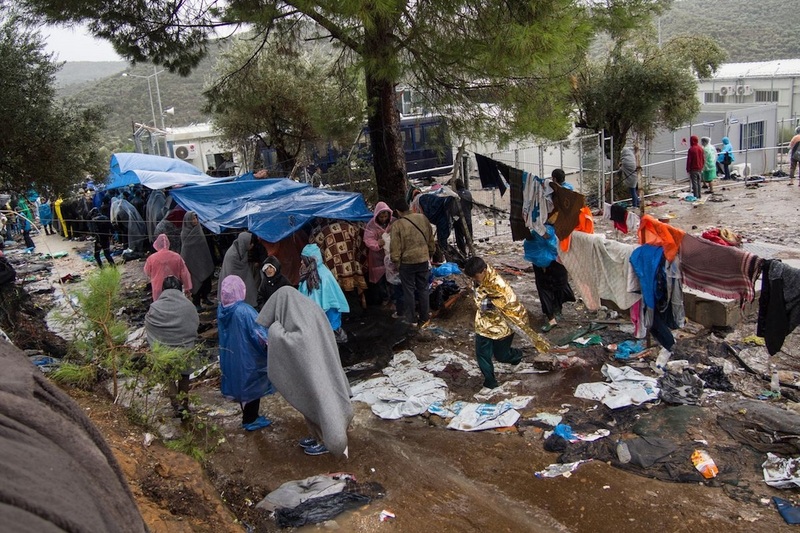 “The people who are camping out in Mytilene rather than putting up with conditions inside the camp were all eager to tell their stories,” Brada explains. Brada would set up his camera at 3:00pm and have one person after another chatting to him, sharing their stories, well into the night. Even more difficult, according to Brada was knowing that while they are entangled in a complex asylum process which keeps them trapped in a form of purgatory, He is able to move freely across Europe and the world at will. Brada explained that his own family background is littered with refugee stories, including his grandmother (a Czech jew) who fled to France during WWII and his father, who sought refuge in the UK during the Prague Spring of 1968. As a result of his own family stories, he said he knows how important it is to offer people opportunities rather than shutting the door on humanity.